Meet the 2018 Summer Staff! Nothing is more important to running a successful camp than having an outstanding staff. Keewaydin prides itself on the quality of its staff! Mature, caring, talented and fun-loving, they are dedicated to providing the best possible summer for our campers. Most of our staff are former campers and have worked at camp for several summers. They primarily come from the Northeast, but we have staff from all over the country and abroad. Our staff to camper ratio is better than one staff for every four boys. Though the majority are college students or recent graduates, we are fortunate to have over 20 experienced teachers on the staff. Each of the four “wigwams” (age groups) has a Wigwam Director. Our Wigwam Directors have over fifty years of combined experience working at Keewaydin. In addition, they are all teachers during the year. The Camp Director is Pete Hare. He has been at the helm since 2001. In addition to his years of leadership at camp, he has a strong educational background, having taught, advised and coached at the middle and high school levels for 19 years. Pete grew up at camp, where his father, Waboos, was co-owner from 1946 to 1982 and Director until 2000. He revels in his role as Director and leads with vision and positive energy. Pete’s family is a very active part of the camp community. His wife, Diane, also a lifelong teacher, heads the tutoring program and directs the camp chorus, while their daughter, Jennifer, is a leader at Songadeewin and their son, James, is on the Keewaydin staff. Their daughter, Ali, was on the Songa staff for six summers. Keewaydin prides itself on its thorough staff training program that focuses on how to effectively and appropriately work with children and how to make camp safe. Staff training for new staff lasts for two weeks and includes a full week learning how to lead Keewaydin trips and a two day Wilderness First Aid course. The entire staff attends one week of staff training, which includes leadership training sessions, waterfront safety drills, CPR training, camp policies and procedures, as well as plenty of time spent reviewing information forms submitted by parents about their children. Guest speakers at staff training are often child psychologists and specialists, including child psychologist, Michael Thompson (the author of Raising Cain and Homesick and Happy). 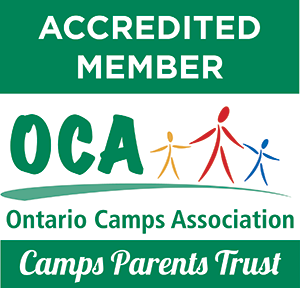 The well-being and safety of campers is our highest priority. Keewaydin has mature, responsible and well-trained staff. Staff hold current Wilderness First Aid, CPR and Small Craft Safety certifications, we also have over 20 lifeguards on the staff. Each year we also invite an expert on camping and children, often a psychologist, to conduct sessions with our staff. Our consulting psychologist, Michael Thompson, works with the staff each summer. Campers’ health is monitored and maintained by a consulting physician and resident camp nurses. We have two nurses in residence all summer and our consulting physician’s office is 15 minutes from camp. All campers are checked in at the Health Center on the first day of camp. The McPhee Dispensary (our health center) is fully equipped for basic first aid and is a quiet, comfortable space for campers who need to spend a day or night there. Camper medication, whether prescribed from home or by the camp physician, is kept in the McPhee Dispensary and is administered by the nurses. Porter Hospital is 15 minutes away in Middlebury for emergency visits. Staff supervise campers’ personal hygiene, including basic hand-washing before meals, teeth-brushing, and showers several times a week. Shower facilities for campers have hot water and private shower stalls. Camp water comes from a well on campus and is state tested each year. Parents: Click to log on & view current camp photos.